offered it to God. We had a hearty lunch together. The word "foot" means the "terminal part of the leg of a human body". The plural is feet. a hundred muscles,tendons and ligaments. The hindfoot is composed of the talus (or ankle bone) and the calcaneus (or heel bone). three cuneiform bones, form the arches of the foot which serves as a shock absorber. The forefoot is composed of five toes. standing) and the planum (the area facing downwards while standing). The instep is the arched part of the top of the foot between the toes and the ankle. problems related to the lower limbs. and feet are washed with water. This is considered sacred and hygienic. Luxury Fashion houses take pride in crafting hand-made fancy footwear. take their blessings. It is considered to be a sign of respect and a lesson in humility. Priests and religious heads too are respected in this way. who was then the head of the Department of Orthopedics at a Medical college in Jaipur. a semi-urban or rural setup in the Indian subcontinent and other developing countries. The feet can be immersed in a tub of lukewarm water and relaxed. Foot exercises are simple and require no equipment and can be done at home. Check for feet exercises here. Note : consult your doctor before attempting this yoga posture. The pilot came from humble background and had his feet firmly on the ground. let the grass grow under his feet. The groom a fire-fighter, developed cold feet and he backed out of the wedding. A milliner, he was, fell at the feet of his wife who threatened to divorce him. Readers, tell us about your foot exercise regime or feet-care techniques. Wow! Such an informative post and so interesting too. You covered Jaipur Foot too!! I like how you share info about every aspect of our parts of body, Kalpana! Very cool and innovative theme. A question... Is there a scientific reason/benefit of touching feet of elders?? Thanks for the appreciation, Shipa. There is a scientific reason behind the removal of shoes. The soles of footwear are rich in dirt and living micro-organisms. These should not enter the house and thus hygiene is maintained. Thanks A Tarkabarka H. for visiting my blog. We always take our body parts for granted and ignore them. Feet bear the whole weight of our body and hence are very important. Thanks Sonia C for visiting my blog. Letters like Z are tricky. but then accepting tricky challenge are fun. Thanks Rob Z T. for reading and commenting. Amazing thing! You're doing this for every letter? Wow! You covered not only the biology but also so much else! Even culture! :D Hats off to you! And so glad to connect with you through this AtoZ. Thanks Chicky K for the encouragement. 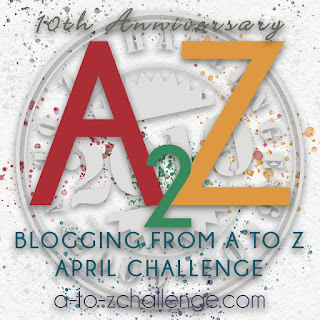 i too am glad that I connected you through A to Z Challenge. Great post, combining biology, culture, traditions. Since I'm from Europe, all the Indian habits are very new to me. Thanks for sharing! It is nice to know about a different culture, isnt it , Andrea. Thanks for reading and commenting. You know what? Until today a foot was no more than something that held me upright or twelve inches! A wonderfully informative post - I'll never take them in vain again. Thanks so much for your visits during A-F week! Take care of your feet, Keith. They bear the whole body weight on them. Thanks for the appreciative comment. Keep visiting my blog. You have left nothing for readers to add! What started as a lesson on anatomy of foot soon changed into an interesting account of footwear, Jaipur leg, care to be taken for healthy feet and finally usage of phrases and idioms of feet.Very informative post. Thanks for the overwhelming appreciation for my post. Do keep reading my posts. I was reading about your mention of footwear. One thing that affects feet badly is to wear pencil thin high heels. My daughter who is in the eighth grade is very tall. She stands at 5 foot 7 and she still wants to wear high heels. It is a problem to wean her away from these and we have purchased her a pair of Kolhapure chappals for casual use and allow her to have her way and wear the heels only on rare occasions. Another thing it is imperative to make sure that be it children or adults shoes fit properly or they may harm the feet. And yes, in India we touch our elders feet. I have not come across this is any other country. Thanks Jai for reading my post in detail. Wearing pencil heels and being on the feet for longer period is detrimental to the health of soles, ankles and spine. Doctors advice flat and comfortable footwear fit for every different occasion. I see people wearing flip-flops and other open footwear for brisk walks.